With a killer press and boundless enthusiasm, Dani Schwalbe won the biggest paying woman’s professional strongman contest ever — Strongman Corporation’s Strongest Woman in the World (August 27-28th in Jacksonville, Florida). This 29 year old athlete from Nampa, Idaho trains at Competitive Edge Athletic Performance Center in Meridian, ID, under owner and the Head Strength and Conditioning Coach Matt Wattles. In college, the D1 athlete played soccer and was a thrower on the track team at Boise State University. Her love of sports is evident in her career as a PE teacher and Varsity soccer coach at Caldwell High school. In my article last week, I challenged her to take on “Grace” at the men’s RX weight. Here is the result of that challenge, where Dani finishes in 2:20, followed by an interview with Schwalbe and her coach. For anyone interested in the future of strongwoman competition, listen up: It’s likely that Dani Schwalbe is going to be a competitor to beat for years to come. Immediately after the “Grace” above, Dani attempted a max lift on the circus dumbbell (ground to overhead, both arms can get the dumbbell to shoulder but only one overhead). She lifted a remarkable 167.2 pounds, roughly 30 pounds heavier than I’ve ever heard of any woman doing before her. Dani, it’s great to chat, and congrats on your recent win. How did you get into training Strongman, and how long have you been at it? A friend invited me to a local competition in July of 2015 and I fell in love with it. I’m still a rookie, and in 13 months time I’ve won the 2015 Strongman Corp Nationals, placed third at the 2016 Arnold World Championship, and won the Professional Middleweights Strongest Woman in the World last week! What are your max lifts on the Log, Deadlift, and Stone? Have you done “Grace” before? Never. Today was the first time I’ve ever attempted it. We don’t train high reps, just heavy weight, like real athletes! Has pressing always been your strong point? I’ve always been decent at it. At Nationals last year, I tied for 2nd with 8 reps with a 155 lb log. I’ve put about 40 lbs on my log since training with Matt. Where do you feel you have room to improve? With only a year under my belt I feel like I can get better everywhere. I want to be the first women to press a 300lb log and hit a 200lb dumbbell. My deadlift has room for improvement as pointed by you [Mike Gill] and Kalle Beck in numerous articles, LOL. I want to hit a 500 lb deadlift within the next year to 18 months. What are your goals for the future in this sport? Personally, I want to win every title there is in the sport. I also want to help grow the sport any way I can by promoting and mentoring others and helping people get involved in the sport. I’m promoting a US Strongman contest in Idaho on April 8th, that will not only have elite level athletes but will have a large novice division to help recruit new athletes into the sport. Do you have a shot at winning the Arnold’s in March? Absolutely or I wouldn’t be going. Potential must be exploited to it’s maximum, so I got more information from her coach Matt Wattles. Matt, what is your background as an Strength and Conditioning coach? I have a M.S. in Exercise Science and over 20 years in strength and conditioning field as both an athlete and coach/trainer. I am a past President of the American Society of Exercise Physiologist (ASEP), have published numerous articles in professional and research journals, and have been an invited presenter at national conferences throughout the country. Other notable athletes you work with? Competitive Edge is designed specifically for those looking for SERIOUS results from their training and the desire to set themselves apart from their competition. In the past 4 years, we have trained over 50 Collegiate athletes earn athletic scholarships. My wife, Amy Wattles – Amy has been a sponsored strength athlete by EliteFTS over six years now. 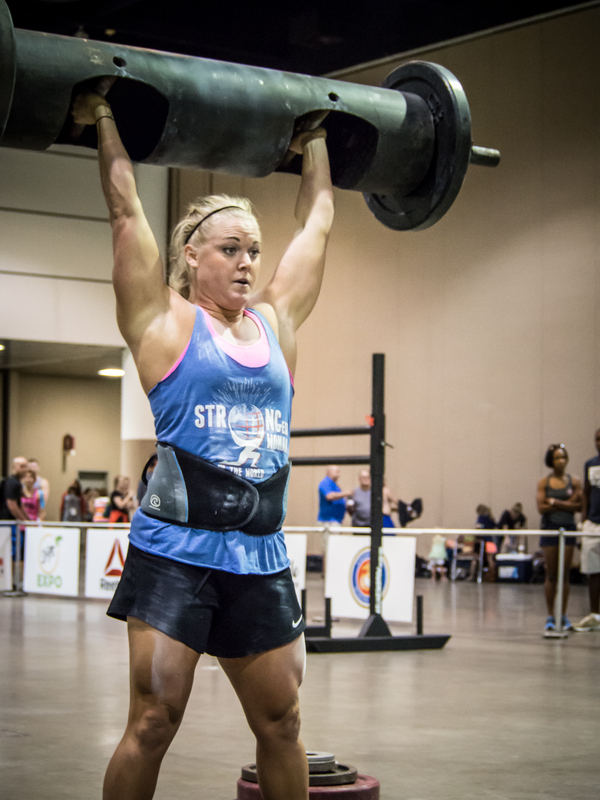 Amy Wattles competes in strongman, highland games, and grip. She has won several national championships in multiple strength sports, holds multiple world records in grip through Ironmind and Grip Sport and has competed in the World Strongwoman Championship. She is considered the best female grip athlete in the world. How near the limit of her potential do you think Dani is? The first time I worked with Dani, I knew she had the potential to be a top competitor in the sport. As a former Division I Collegiate Soccer player, she is a very gifted athlete and moves like an athlete. She’s brutally strong, extremely fast and very explosive. Dani’s very new to the sport. Her first competition was just last year. From my perspective, after working with strongman competitors and being at dozens of competitions throughout the years, I believe it takes about 3 years of consistent training to see the biggest changes in competitors as their tendon and ligament strength really starts kicking in. I think Dani still has a few years before she starts hitting her competitive peak, from there athletes get a lot smarter about how their body responds to volume and training. What do you feel Dani can improve the most? Even at this early stage of her Strongman career, Dani has very few holes in her game. The biggest areas she needs to work are her deadlift and her carry medleys. When I started working with Dani, she struggled with 390 on the deadlift. We knew we had to bring this up as the top middle weights are pulling 450 to 465 deadlifts. In about 15 weeks, after changing her technique and working her through a few volume and intensity cycles, she was pulling 390 for 5s or about 440. I have no doubt that Dani will be pulling 500 in the next year or two. The other area she needs to improve is her carry medleys. This is more about bringing up her work capacity and this area will improve dramatically as she advances through her training cycles. How close to the ceiling of women’s strength do you think we are? What have you noticed that women seem to be better or different at than men? We’ve been involved in Strongman since 2003 and have seen the sport evolve light years. Personally, I don’t think we are anywhere near the ceiling in strongwoman. I think as the years go by, you are going to see more and more collegiate athletes crossing over to strongman looking to continue their competitive careers. By looking at those numbers and seeing how small the current sample of female strength athletes is, I have no doubt we are just starting to scratch the surface. As far as males and females, I’ve seen numbers in the research indicating women have the potential to have about of 2/3 strength levels of men. Using some simple calculations, if men are hitting 500 lbs log presses, I think the potential is there for a female to hit a 300 – 330 lb log press at some point. Russian powerlifter Kirill Sarychev has hit a raw 739, which would tell me there may be a female at some point out there capable of a 490 bench press. I would imagine the same would apply for other lifts as well.